Yellowhammer’s Frankenhammer will be an annual brew for Halloween. The Nook, in Huntsville, has the whole supply of this first batch (very small batch). The Nook and the brewery are already planning for next year’s batch when The Nook will pull out some of this year’s kegs to be served a long side next year’s batch. The beer pours up with a minimal head that fades quickly without lacing. The aroma is wonderfully filled with deep roasted malt tones that hints of alcohol somewhere hidden below the surface. The taste starts at the tip of the tongue with a crispness that vanishes quickly. Malt flavors take over your mouth as the alcohol tries to push through the malt flavors, but it is held back. As the finish approaches, the maltiness gives way to bourbon like flavors enriched by alcohol burn in the finish. Overall, Yellowhammer Brewery has hit on there hand with this beer. Hopefully, next year, they will brew a larger batch. 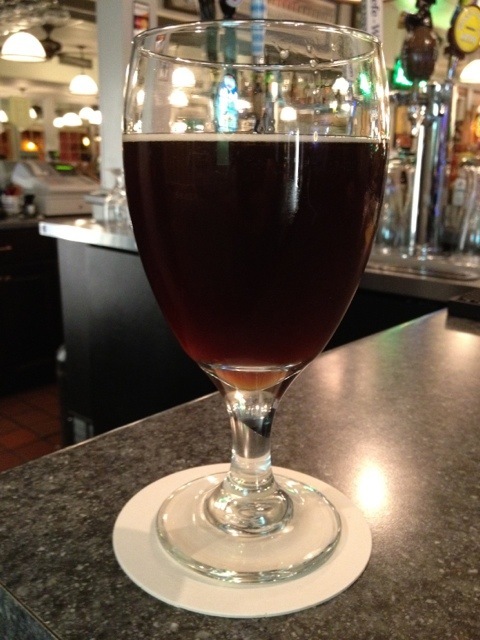 The style is a Belgian Strong Dark Ale and has a 10.5% ABV. Fellow reviewer, Jay Kissell, reviewed this beer for the Huntsville Times’ Go Magazine. This entry was posted in Brews and tagged Yellowhammer Brewing by Brian Allen. Bookmark the permalink.